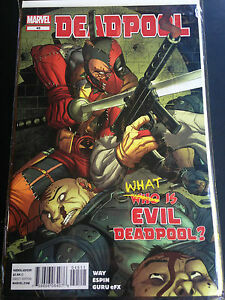 B11, Comic Marvel, # 45, What Is Evil Deadpool. A book in excellent condition. May be very minimal identifying marks on the inside cover. Very minimal wear and tear. A book that has been read but is in good condition. We accept payment from Australian customers by paypal, money order, bank deposit. We accept payment from overseas customers by paypal only. Contact is to be made within 3 days of purchase and payment is required within 7 days.